Vacation rental house. 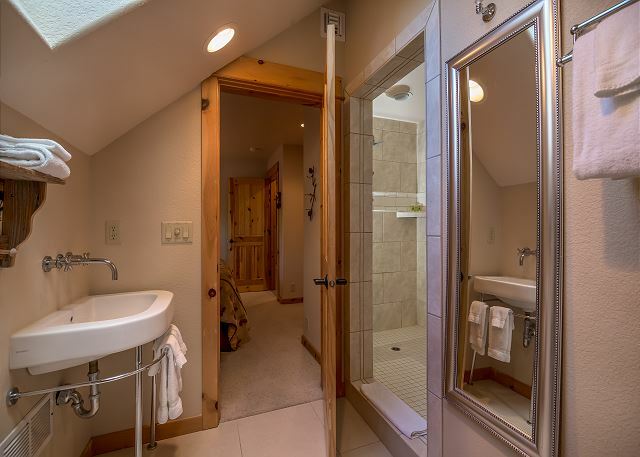 Sleeps 18, 7 bedrooms, 6 bathrooms. No pets allowed. 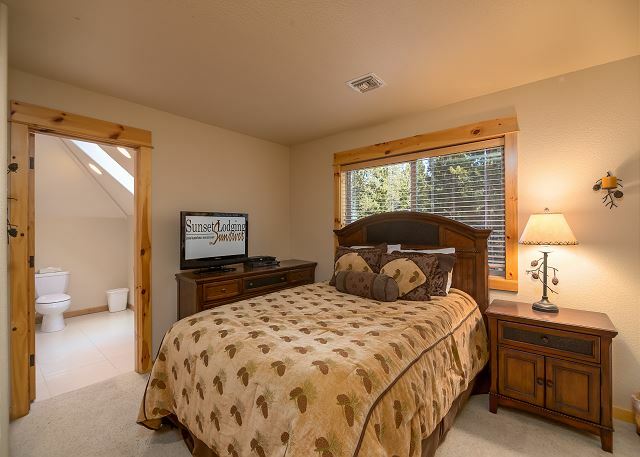 Up to 18 of you can sleep comfortably in this 4,520-square-foot home with 4 master bedrooms. 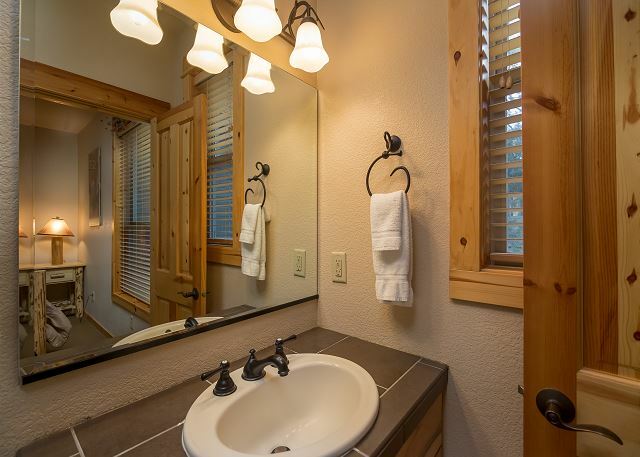 Get cozy by the fireplace, watch movies with the DVD/Blu-ray player, and soak your muscles in the hot tub. Bikes are provided for your exercising pleasure; there's a barbecue for grilling your favorite foods. 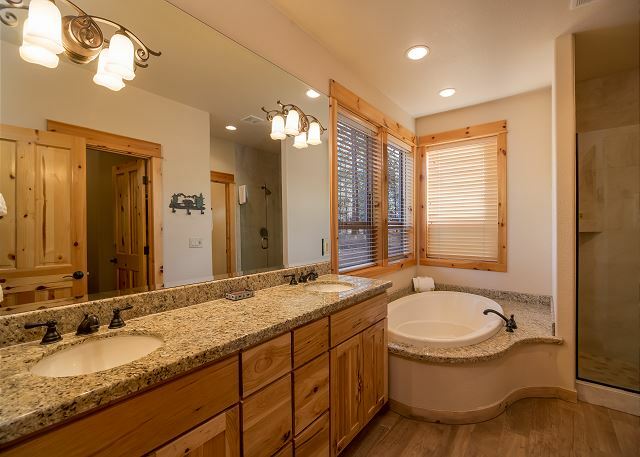 The two-level home also boasts eight televisions, a CD player/radio in the master bedrooms, a washer/dryer, and a double car garage with a second refrigerator. 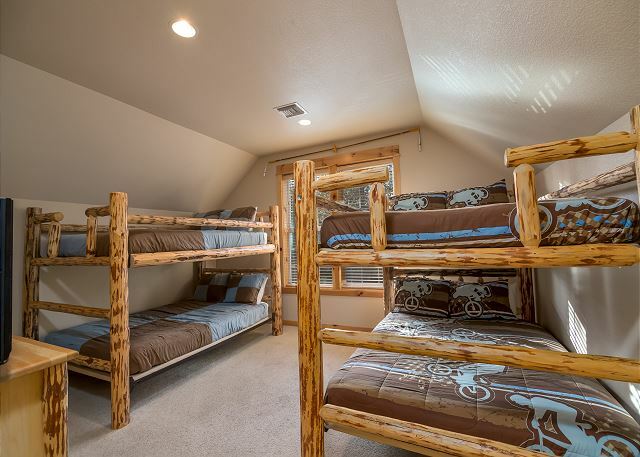 For your sleeping delight, there are five king beds, a queen bed, and two sets of queen/queen bunk beds. Add to your vacation enjoyment by visiting the Sunriver Nature Center & Observatory, taking a sleigh ride, biking, hiking, fishing and playing golf. We had 8 individuals stay in the home from Thursday, April 11 - Tuesday, April 16. We are all from different high schools in the Willamette Valley. We thoroughly enjoyed our stay in your beautiful home. It was close to the Great Hall and we could enjoy each other's company, as well as have our privacy too. We would recommend a new barbecue, as the one that is there is falling apart. We were able to use two thirds of the right side of it...but it is ready to be replaced. We have already reserved it for next year. Thank You for the 5 star Review, Tim! 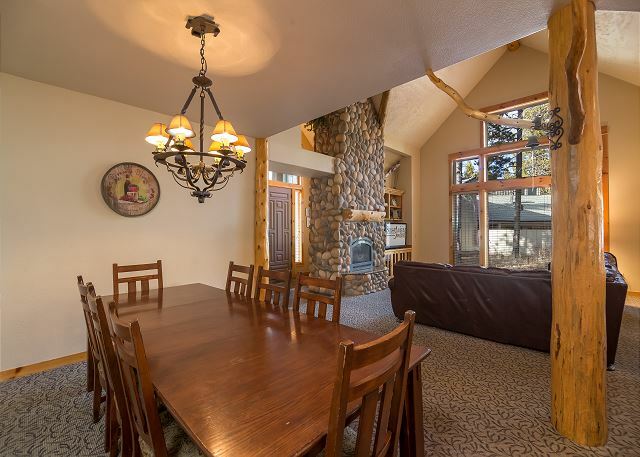 It sounds like this home was PERFECT for your group in size, accommodations and location! We are happy to host you again next year! I will send our maintenance team out to look at the BBQ to make sure it is in good shape... See you in Sunriver! The bed on the ground floor were too high for my 84 year old Mother to climb on to. 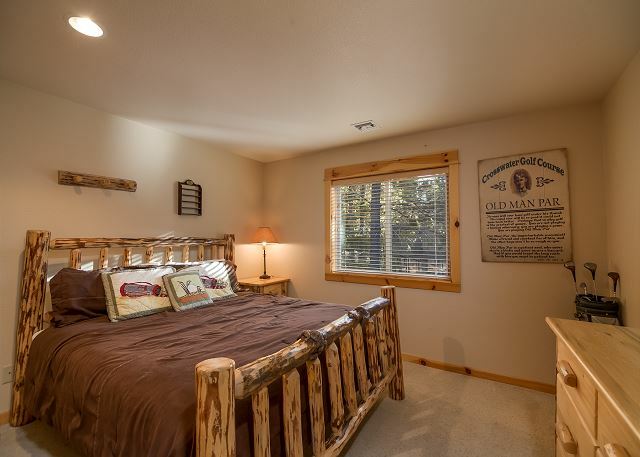 would be great if there was one bed which was not on frame+boxspring+mattress. Thank You for the 5 star review, Maya! Glad you enjoyed this beautiful home. If you find that you are staying with us and need assistance, please do not hesitate to call! We would have brought out a step stool or similar to help! Come back soon! We had a wonderful stay at this house. It is beautiful inside, large and roomy. A good location for us too. As with any rental there were a couple of problems but when you called for service or help they were there to give us what we needed. The manager gave us excellent customer service and was very kind, friendly and helpful. 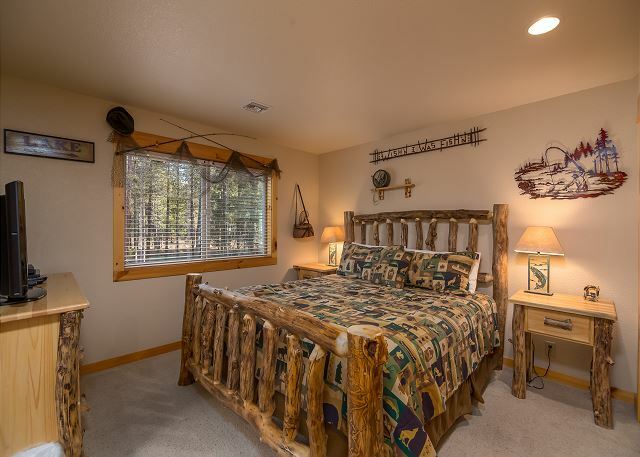 We have been staying in Sunriver through Sunset Lodging for over 15 years and have nothing but good things to say about them. Very happy with them. I would recommend this property to my friends and relatives. We enjoyed eating at the Cafe Sintra, excellent service and very good food! Also, the Belly Burger place has excellent burgers and fries! A quiet community where anything you need is there, also a grocery store too. Thank You for the 5 star Review, Shirley and Neva! We love hosting your group every year and thank you for your kind words about our staff and the service we provide. See you next year! We stay each year in Jackpine 9 and 10 as part of a golfing trip. The combination make an excellent venue. Most of our socializing and eating is in 10. Thank You for your review, Rob! So glad you had another great stay, Can't wait to see you again next year! The house was perfect for my growing family. 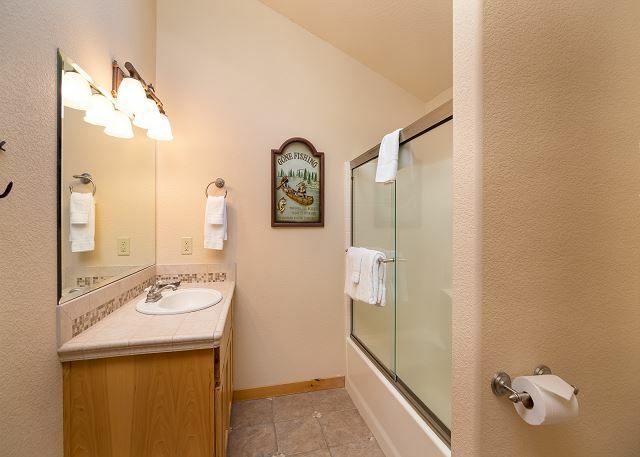 In a great location with easy biking to water park and mall. Thank You for the 5 star Review, Julie! So glad that you enjoyed the location and found it to be perfect for your family, Come back soon! Most everything worked well. New double oven since last visit was appreciated. But air conditioning in first floor master bedroom was difficult to figure out. We left the bedroom door open to keep room cooler. Toilet lid in master bathroom was loose and moved around a lot. But we still love Jackpine and are coming back next June. By the way, it would be nice if we could get to bic trails without having to ride on streets. Thank You for your review, Ronald! We are happy to hear that you enjoyed the home so much that we will see you next year! Perfect house for our large family of children and grandchildren. The location was perfect for either riding or walking into the village. the only negative was the bunk beds and a couple of the other beds squeaked. This was our second year in this house and we have booked it again for next year. Thank You for the 5 star Review, Megan! Jackpine 9 is a wonderful location for large groups and we are happy to hear that your family was so happy that we will see you again next year! Thanks, Again! Very lovely home!!! Had everything we needed. Thank You for your review, Karen! We hope to host you in Sunriver again! 100% Perfect house for a family Christmas Reunion. The lay out is exactly right, with a huge great room/dual dining areas/ and kitchen with a massive eating bar to congregate around. All 20 plus guests could be involved in one conversation. The plus is that most of the bedrooms are removed from the great room and the early to bed, early to rise were not kept up by the more "rambunctious" group. House is far enough out to be very quiet, but close enough to walk or bike to the center without too much exertion. It was Great! Thank You for your great review Todd! 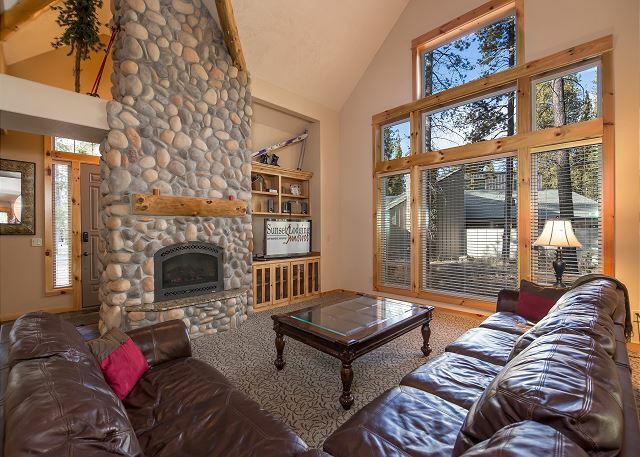 Jackpine 9 offers a wonderful space for large groups and we are happy to hear that you enjoyed the home as much as we do. 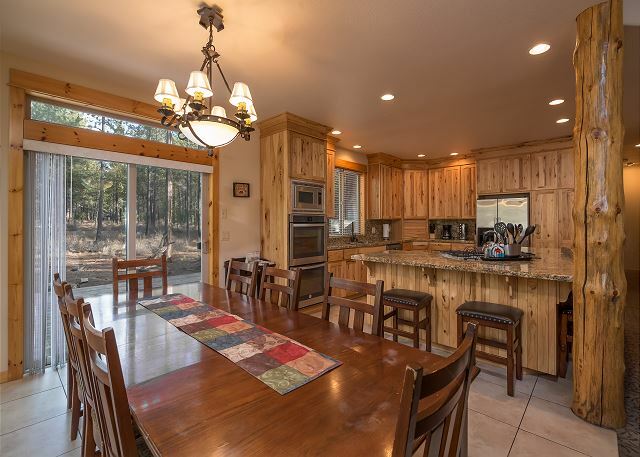 We hope to host you in Sunriver again soon! We made lots of great memories this trip and enjoyed every second from our trips to Bend to the adventure of Paulina Plunge. 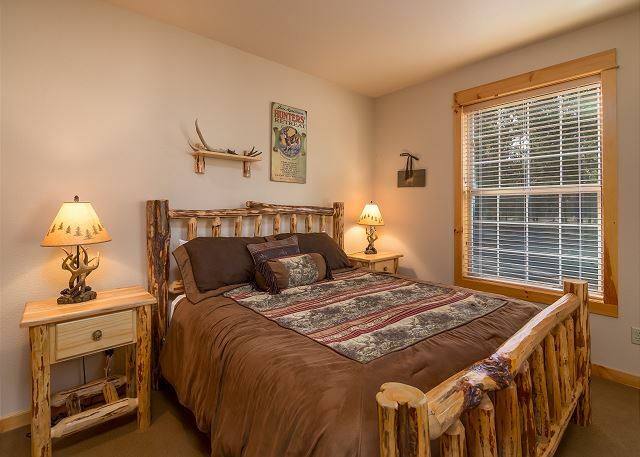 Kristi, we're glad you enjoyed Jack Pine #9 and your stay in Sun River. We can't wait to have you back in the future and we're glad we could help provide a few awesome memories! Jackpine 9 doesn't let us down again. What a great place for us and our kids. Lots of room and a great location. Thank you! Hi Gary! Thanks so much for the great review! Jackpine 9 is the BEST! See you soon in Sunriver! First time in many years our family with 4 adult children and family were able to spend Christmas together. It was totally amazing. The house suited us perfectly. This is so awesome to hear, Linda and we feel honored that you chose Sunset Lodging and Jackpine 9 to celebrate your holiday together! We hope you will make this a family tradition for many years to come. Thanks kindly for your feedback! Very nice. Fit our group well. Thank you for being great guests of Jackpine 9, Darlene! We hope you'll get back to Sunriver soon. 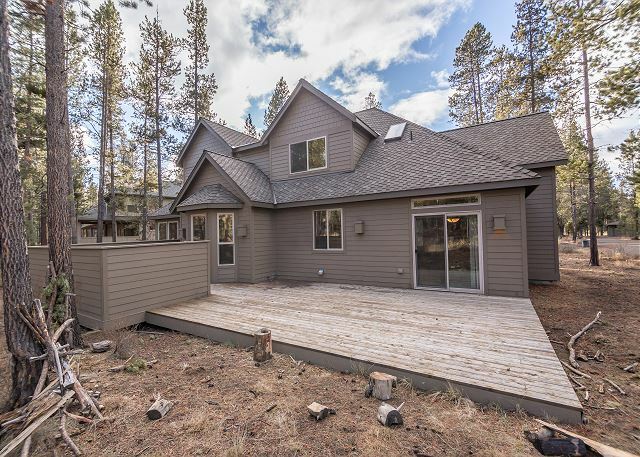 We stayed in this home for a family reunion, and we had the best time in Sunriver, and staying in this home. 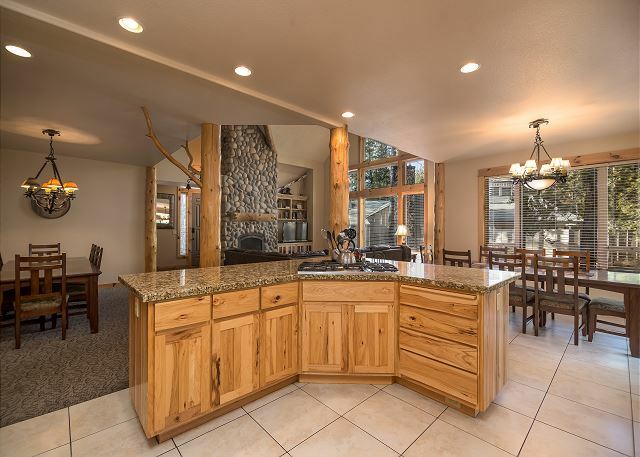 The kitchen was well stocked with equipment, and the home is located within the resort in a most desirable area; walking distance to all conveniences, such as grocery store, restaurants, etc. We loved that the garage was equipped with bicycles for our use. So glad to hear that Jackpine 9 worked well for your family, Nancy! We hope to see you all back in Sunriver soon! We rented this house to accomodate 6 couples for my husbands 40th birthday celebration. It was a beautiful home that we had a lot of fun in! Would also be perfect for families as well. We planned on riding bikes to dinner one evening, and one of the bikes had a flat tire. Sunset Realty came out and replaced the bike for us, so we could all ride bikes together! Thanks Neal! Please come back as soon as you can, we look forward to your return. 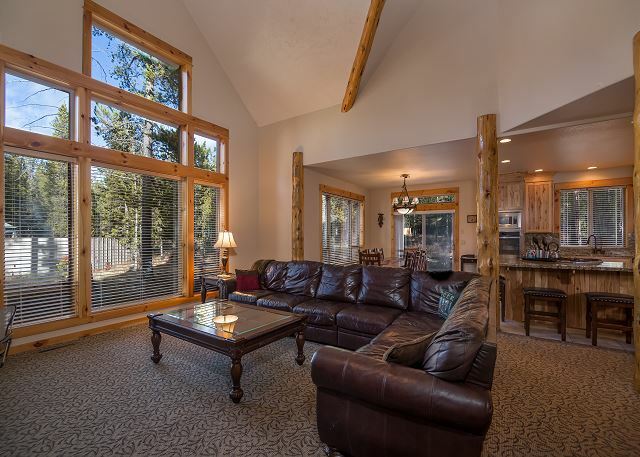 We had a group of friends from across the country all come to Sunriver for the first time, and this was the perfect home to stay in! Bedroom setup was perfect for a mixed group with both couples and singles, the common areas and kitchen were extremely comfortable and inviting for quality group time, and the proximity to the Village was a huge bonus. Check in and check out were seamless, the place was perfectly clean and exactly as advertised, and we had no issues. Can't ask for much more! The house was beautiful, well-kept, and very spacious. Because of those factors and the surrounding snow, our group had a wonderful time at Jack Pine #9. 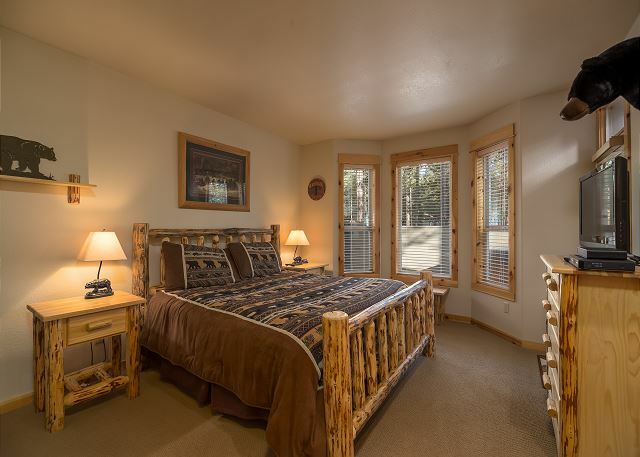 Renting the house online with Sunset Lodging was a pain-free process. The perfect house for multiple families! We had the best time! We made fun meals, had plenty of seating for our group with the 2 dining tables, played in the snow, walked to the village to ice skate and go out to eat. It was the perfect get away! 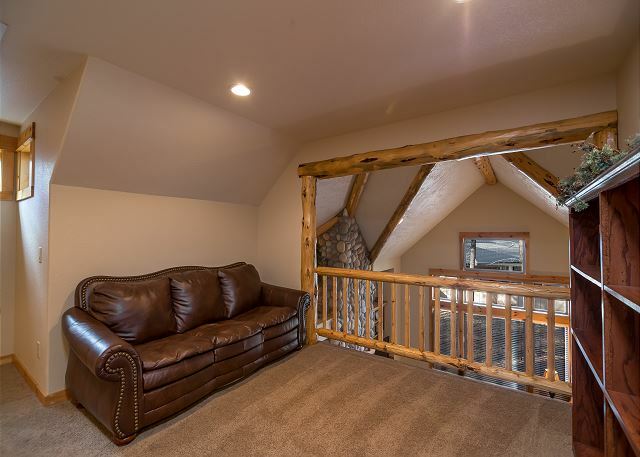 This unit had plenty of space for our family group of 9 adults and seven kids. The queen-bedded bunk room was a delight for the older kids and the bikes were well used. Tons of kitchenware assisted the foodies in our group. They saw heaven upon viewing the two blocks full of great knives. We nearly abused the bike paths and would have done so also to the SHARC but the weather was rainy at the beginning of our week and the kids came back after a 45 minute SHARC visit with blue lips. We all enjoyed hikes around Crater Lake, the Newberry Volcanic Monument, the Deschutes and Benham Falls, and the parks in Bend. The refrigerators stayed primed with local brews. Great stay, wish it were closer. James, we cannot express how much we love to hear about happy guest families. Being a family ourselves, we hope we've thought of everything other families might need to have the best possible time together (which is what lifelong memories are made of!) Please round up the Kaesers again soon and head for Sunriver! We'll keep the place sunny and beautiful for you! Jackpine 9 was perfect! It was very close to the Great Hall and Homestead where the conference was held, had plenty of bedrooms for our group of 9, the kitchen and dining area was perfect for all of us to eat together and the deck was a great place to relax with some beverages. We will definitely be back! We're so glad we were able to find something to fit all of your needs, Rich! Please come see us again! Wife's family of 4 sisters plus husbands, 92 year old mom, a few adult children and grandkids (14 in all) much enjoyed our stay at 9 Jackpine over the Christmas holiday. 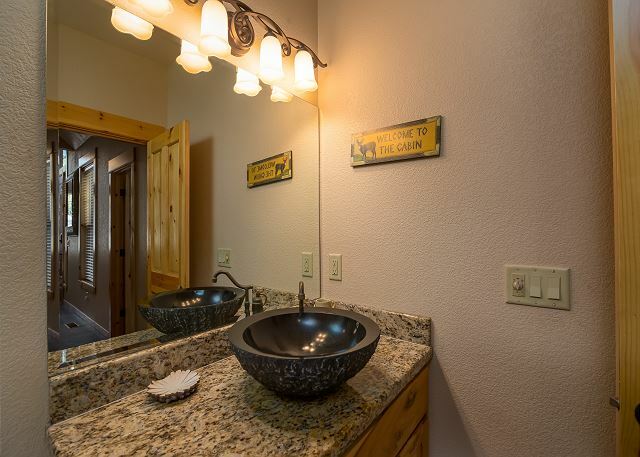 There was plenty of room for gathering and enough privacy for balance, the home was well equipped, clean and comfortable (though we might have liked a little more great-room lighting) and very convenient for walking to the Lodge or the Village Mall or around the big meadow. The kitchen was well stocked with utensils and serving dishes, and we had enough pantry space for all the food we brought and counter space adequate for building gingerbread houses. 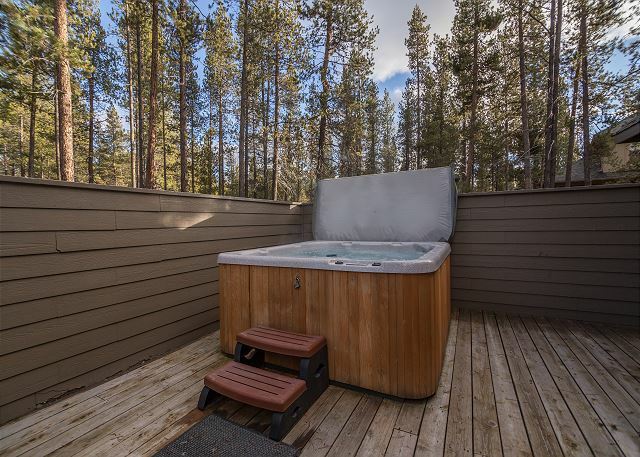 With bikes (before the snow fell on Christmas morning), pool table, TV (and DVD player), games and a hot tub there was plenty to do for this active family. The Sunset Lodging staff were always responsive and helpful, and we would definitely return to this property for another family gathering. Thank you for your WONDERFUL review!!!! 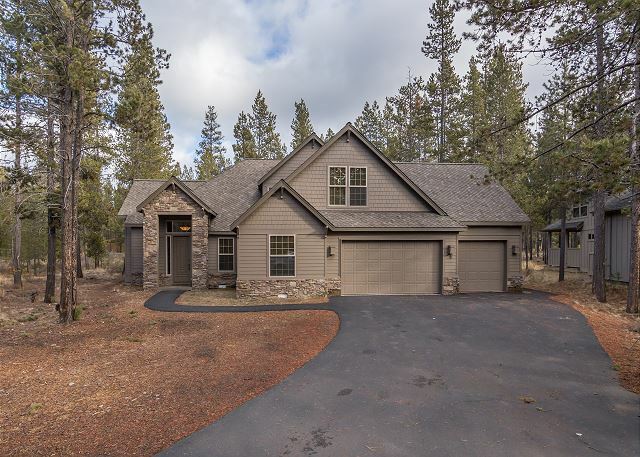 Jackpine 9 is a perfect home for large family gatherings and we are so pleased to hear that your large group enjoyed the home! Thank you for your compliments to our staff as well, we love to hear that our staff is doing their best to keep our guests comfortable and happy! This is a very nice house that has enough room for multiple families. Location is excellent, within walking or riding distance to the store. The only issue with the house and the reason I knocked off one star is that it doesn't have a second refrigerator. 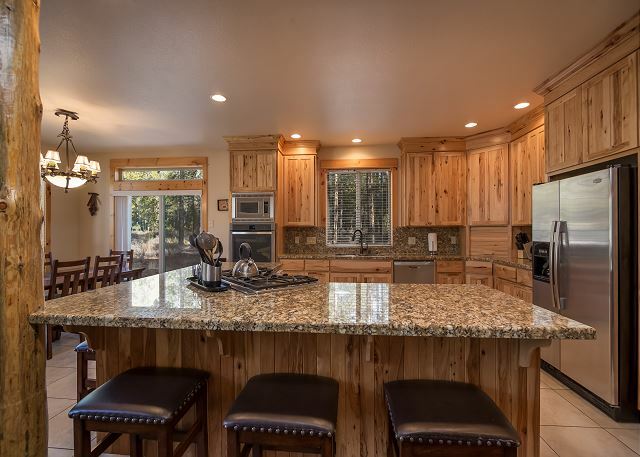 I've rented many houses in Sunriver and this is the first house of this size that does not have a second refrigerator for drinks. We adapted and used coolers with ice for drinks. Thank you for your feedback on this home. We will contact the appropriate managers to look into the idea of a second refrigerator in the home! Please keep us in mind for your future vacation planning! We had an absolutely amazing experience with the house. It was clean, beautiful and designed to accomodate a large group, which we had! 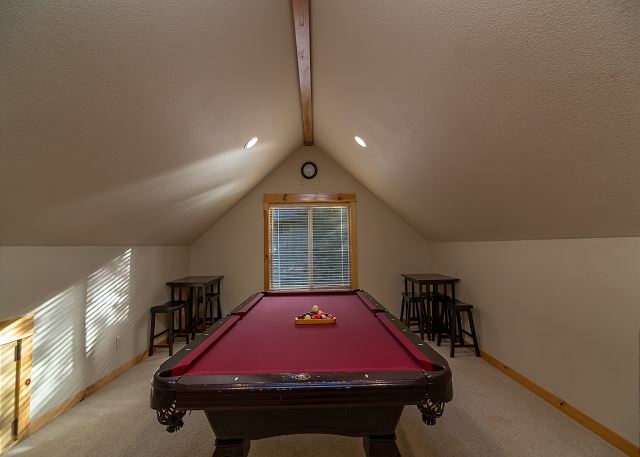 Great for kids and adults alike, and we made good use of the pool table, the hot tub, and the bikes. Service was also excellent; we requested cleaning of the hot tub twice and the technician arrived shortly after the call both times. The major surprise was lack of passes for various activities. Other than that the vacation was perfect!!! Quick response on the air conditioner and tv issues. Very friendly staff, whom we greatly appreciated!!!! Awesome property. Super clean. Always satisfied. Jackpine #9 was a great house to rent for 5 families with kids. There were plenty of bedrooms and bathrooms, an extra large sectional for everyone to lounge at and plenty of kitchen and dining space. The decor was beautiful. I will definately be renting this one again for next years vacation!